Having a case fail to materialise on the carousel is one of the most nightmarish things that can happen to a traveller. However, pack everything you need into your carry-on luggage and it ceases to be a concern. It sounds like an easy enough fix but in order to avoid recreating that scene from Meet the Parents as you try and fail to wrestle your battered old suitcase into an overhead bin, it’s a good idea to make sure your carry-on is properly suited to the job. It’s a sentiment echoed by Jorrit Jorritsma, co-founder of Millican, a manufacturer of bags designed for adventure. “The more you travel, the more you realise what you really need to take to make your journey as easy as possible,” says Jorrit Jorritsma, co-founder of adventure bag specialists Millian. “Invariably you need less and less. Plus, let’s face it, having a heated argument with an air hostess about the dimensions of your bag probably isn’t the best way to start a romantic weekend away, a business trip, or any other type of excursion. 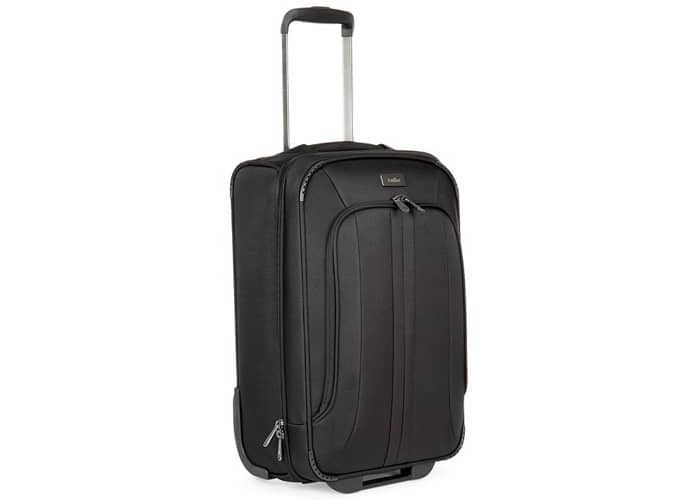 Instead, invest in some proper carry-on luggage that completes your airport look and has the added benefit of letting you glide through arrivals with a smug look on your face. Selecting the right receptacle to accompany you on your travels can be harder to negotiate than North Korean customs, so to help you make a fully informed decision, we’ve rounded up the four main types of carry-on luggage to cover every possible set of roaming requirements. Whether you’re a bearded nomad, an eight-year-old schoolkid or something in between the two, a backpack is nothing short of essential. It’s arguably the ultimate carry-on companion, due to its ease of use and often surprising capacity. Plus, if you want to keep your hands free for drinking that obligatory 6am pint in the terminal, there is no bag better suited to the job. Flights may not be very exciting but they do create a handy window in which to get some last minute work done. With that in mind, you’ll need some protection for your computer. Laptop bags are the digital age’s answer to the briefcase. They’re practical, they can be stylish and if you’re travelling for work, you really can’t afford to be without one. If you’ve ever witnessed the way some airport baggage handlers actually handle your luggage, you’d be forgiven for never wanting to check a bag in ever again. Thankfully, you don’t have to. If you’re clever about it, you can pack the essentials in a small case and wheel it right onto the plane with you, thus ensuring the safety of any priceless glass ornaments you might happen to have brought along with you. Surely the weekender’s best friend, the trusty duffle bag provides all the room you need to pack clothes, shoes, accessories and more for a few days (or a week if you’re travelling light) away. It’s accommodating capacity makes Mary Poppins’s handbag look like a coin purse and if you pack like a pro (more tips on that later), you’ll not need to take anything else. Every trip is different, which is something that should be reflected in your choice of luggage. After all, you wouldn’t take a Louis Vuitton suitcase for a trek through the Amazon rainforest, just as you’d probably avoid rocking up at an overseas business meeting with a 70-litre backpack. Different sacks for different settings. Simple. With that very much in mind, here is our roundup of the best carry-on luggage to fit the job, wherever you happen to be going. British brand Antler has been honing its bag-making skills for longer than most. Established in 1914 to make leather wardrobe trunks for ocean voyages, it didn’t take long for Antler to branch out into all areas of baggage and make a name for itself in the process. Granted, most of Antler’s designs aren’t exactly eye-catching. That’s the point. If what you value is reliability and simplicity you can’t go far wrong. Plus, a work trip probably isn’t the best place to be showcasing your love for avante garde fashion anyway. Nineties film references aside, Samsonite is a reliable frequent flyer and with the brand’s unassuming styling, it’s always going to be a foolproof bet when it comes to packing for business. The future of the high street is still perilously unclear but for the time being at least, Marks & Spencer is still one of its shining lights. The brand is deeply ingrained into the British way of life and is renowned for its affordable classics. The carry-on luggage on offer here may not be the most glamourous, but the excellent weekend bags look more expensive than they really are. 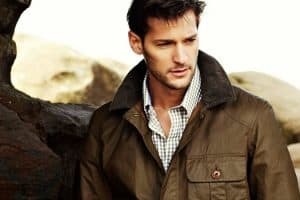 It’s not a huge leap to assume that if Newcastle-born outerwear brand Barbour ceased to exist, the British countryside would simply collapse in on itself and shrink into nothingness. The iconic label’s waxed-cotton goods began making their way out of rural England and into the world’s cities some time ago, meaning you’re just as likely to see one being rocked by a London investment banker as a Northumbrian cattle farmer. This universal appeal is no doubt down to Barbour’s unique blend of smart looks and unbridled durability – a winning combo if ever there was one. Hailing from the Netherlands, Mujjo has made it its mission to redesign the way we transport our technology. Crafting luxurious cases for laptops, tablets and smartphones, it aims to turn your devices from electronics into bona fide fashion accessories. A laptop is a must when it comes to a work trip; that tattered old computer sleeve is not. Go for one of these full-grain leather cases instead and never get ridiculed in a meeting again… well, not for your luggage situation anyway. It’s almost impossible to walk down the street without encountering a Herschel bag hanging proudly off someone’s shoulders. Which, considering the brand has only existed since 2009, is quite an achievement. Known for its casual, classically-styled products and for pretty much single-handedly repopularising the backpack, Herschel is a great choice when it comes to choosing the perfect day-to-day luggage. If Herschel is the Kendrick Lamar of the backpack world then Eastpak is the Run DMC. The Bostonian luggage brand has been creating simple, stylish bags since the early fifties and doing a sterling job of it too. After starting life focusing solely on outdoor pursuits, Eastpak has grown into a fully-fledged lifestyle brand, producing kit to cater for everyone from the extreme sports junkies to the stylish guy jetting off for a weekend away (aka you). 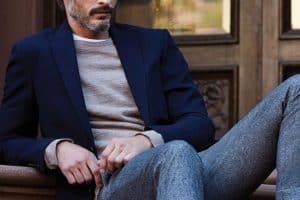 J.Crew has been a staple brand in American wardrobes and beyond since it first started pumping out simple, well-designed clothes during the early eighties. Today it’s a global retail force to be reckoned with and its trademark casual styling make it the perfect place to pick up a relaxed but stylish weekend bag. The preppy, East Coast aesthetic that made J.Crew famous is about as timeless as looks get. So if you want a casual duffle bag you can keep pulling out for years to come, this is a good place to start. Asos is always a fantastic spot to bag yourself a bargain, and if the bargain your looking to bag yourself happens to be, well, a bag, then you’re in luck. 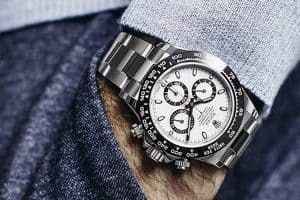 As well as a whole host of brand-name backpacks and holdalls, the online retail giant also offers its own takes on some classic carry-on luggage, at prices that will leave you with plenty of change to add to the spending money jar. For a slightly smarter option, Sandqvist may have what you’re looking for. Founded in 2004 by brothers Daniel and Anton Sandqvist, and their mate Sebastien, the Swedish lifestyle brand draws its inspiration from the sprawling Nordic landscape, combined with urban living. As a result, its bags are stylish and practical in equal measures, and unmistakably Scandinavian. There’s a reason why this Californian outdoors brand has a reputation as the best in the game. Put simply, it’s because it is. Plus, not only is Patagonia’s gear a cut above the competition, it’s also sustainably made, using recycled materials wherever possible. Saving the planet and travelling all over it at the same time is all in a day’s work when you’ve got one of these bad boys strapped to your back. Professional mountaineers have trusted The North Face to get their belongings safely up the world’s most treacherous peaks for 50 years. 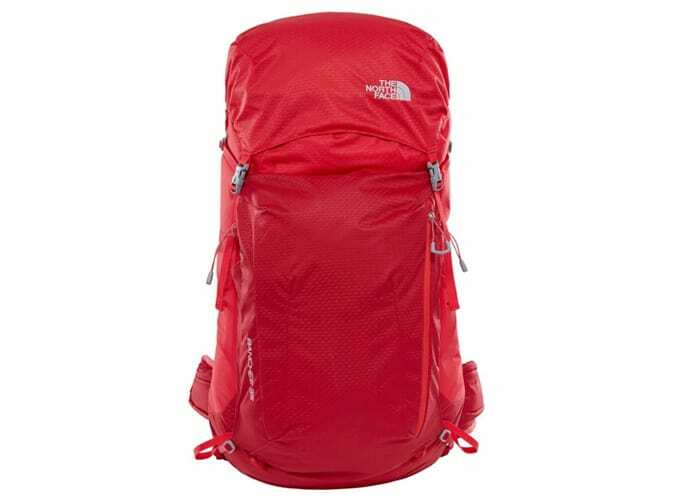 That’s because the brand’s bags are some of the most robust around and have earned a reputation among climbers, hikers and runners for being the best in terms of both industry-leading tech and faultless reliability. When it comes to picking a bag to take you around the world, those are two things that will help you out no end. Hailing from the heart of the UK’s Lake District, Millican makes luggage designed by adventurers, for adventurers. The brand’s timeless styles all have practicality and sustainability at their core – it’s just a bonus that they look great too. Using recycled materials, Millican creates unique and functional bags that are designed to stand up to the rigour of travel…even if that does just happen to be a three-hour flight to Ibiza or a train home to visit your parents. If you grew up in Scandanavia, the Fjallraven arctic fox logo will no doubt already be embedded into your memory. The Swedish brand has been making rucksacks for well over half a century and has gotten pretty nifty at it in the process. One of the main draws for travellers and adventurers is the patented G1000 fabric, which is extremely durable and can be waxed at home to increase water repellency. Very handy for those occasions where the weather abroad isn’t exactly living up to expectations. Started with nothing but a single sewing machine and an idea to make innovative backpacks for adventurers to the highest possible standards, Osprey somehow went on to become on of the biggest names in bags on the face of the planet. The Californian brand now makes some of the most technical, high-performance packs around, and using a whole factory full of sewing machines, no less. Impressive stuff, we’re sure you’ll agree. Now one of the most recognised luxury fashion houses in existence, Louis Vuitton started life making high-end leather trunks and luggage for the Parisian fashion elite. Granted, at such high prices an LV bag or case isn’t the kind of thing you want to get battered and scratched in an overhead compartment, but to be honest, if you can afford one, you’re probably taking a private jet anyway. Combining the Italian for ‘suitcase’ (‘valigia’) and the English word ‘extra’, these Milanese bags certainly live up to the name when it comes to the price points. However, if you’re willing to cough up, you’ll be rewarded with a meticulous approach to design and the finest leather money can buy. As if that wasn’t enough, each piece of luggage comes with its own dust bag. A bag within a bag – it doesn’t get much more (Val)extra than that. After famously proving the strength of its cases by having an elephant stand on one of them, Globe Trotter became the luggage brand of choice for the likes of Sir Winston Churchill, Sir Edmund Hillary, the actual Queen and many, many more. Hey, if it’s good enough for them then it’s good enough for us. The brand that built its foundations on manufacturing women’s handbags made from pure, organic catnip also has a sideline in men’s luggage. Mulberry’s holdalls are some of the nicest around, featuring unrivalled build quality and stunning full-grain leather. A bag like this may cost a ton but think of it as an investment rather than just a one-off, extravagant purchase – chances are your son and perhaps even his son after him will still be using it long after you’ve checked out.